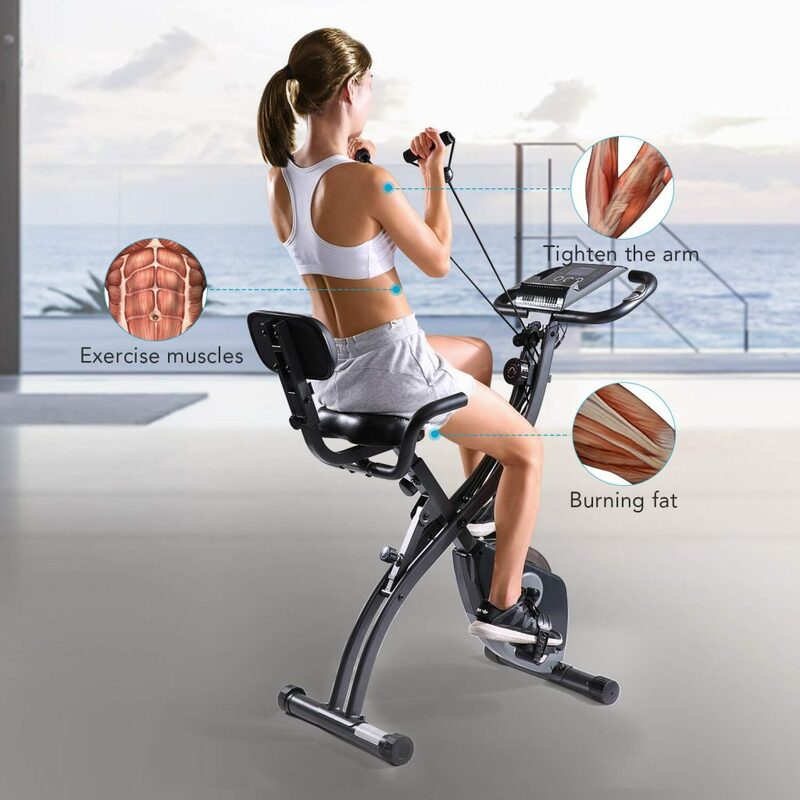 MaxKare Semi Recumbent Magnetic Upright Exercise Bike has a sleek and modern foldable design, adjustable arm resistance bands, and an LCD display panel with a pulse rate monitor. As a brand new release fitness product it has only a couple of product reviews online, but they are positive 5 star ratings. You can enjoy your smooth, stable and quiet rides because of the friction-free magnetic resistance not coming in contact with the flywheel. This also makes this bike a very low maintenance one. There is a tension knob in the middle to adjust the 8 levels of resistance and challenge. And the closer the magnet the higher the resistance you experience will be. You can target a variety of muscles and keep a full range of motion with the solid arm and leg resistance bands provided. 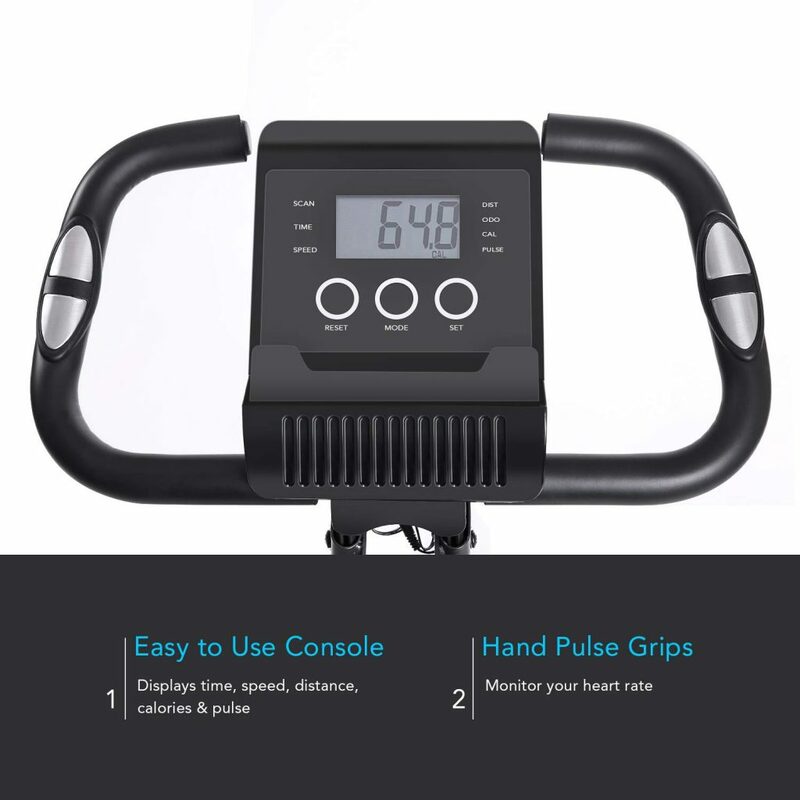 The multi-functional digital LCD display panel is easy to read and use and helps monitor your workout progress. It gives you the usual information with the standard stats of calories, distance, time, speed, scan, odometer and pulse, along with the reset, mode and set buttons. You can monitor your heart rate via the hand pulse grips. You want to stay in your target heart rate zone to effectively burn calories and fat. MaxKare Recumbent Bike is suitable for use in smaller houses that lack space, as you can conveniently fold and roll it on its transport wheels. The large adjustable seat is nicely padded and comfortable, with a backrest. And you have the anti-slip protective pedals with solid straps. As a safe and stable bike with a thick steel tubing it can hold up to a total of 330 pounds of user weight. It should be quite easy to ride for most people between the resistance levels of 1 and 5. And you’ll feel it more starting with 6, and gets harder at 7 and 8. The LCD display panel works with batteries that are included in the package. So you don’t need to keep the bike near a power outlet for the display panel to operate. It is shipped nicely packaged but unassembled and may take you about an hour to put its pieces together, and shorter if you have someone helping you. You’ll realize how solid and stable it feels after you assemble and start using it. It is suitable for use by shorter or taller people with the seat being adjustable for height. As folded it will easily fit into your closet or in a convenient corner. Kids must be supervised by the adults when they’re using this bike. This bike is offered with a 90-day warranty during which period they will repair any defective parts or replace them. The bike can also get replaced or you may get a full refund from MaxKare which designs and engineers it. The MaxKare Semi Recumbent Bike offers a great deal for the dollar and works well. We don’t hesitate to recommend it to anyone on the market for a low cost but durable and functional foldable bike.